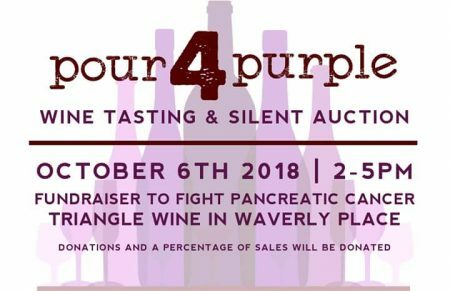 For those in the Raleigh area, please come and support the NPF North Carolina Chapter this Saturday, October 6th, for the Pour 4 Purple Wine Tasting and Silent Auction at Triangle Wine Company (575 New Waverly Place Ste. 103-B, Cary, North Carolina 27518). A percentage of the proceeds will be donated to the NPF. We hope to see you there! 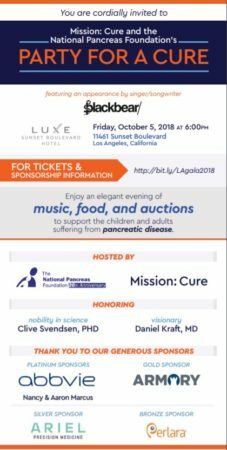 Join us for an evening to benefit the National Pancreas Foundation! On this special night, we will be honoring Dr. Diane M. Simeone with the Nobility in Science Award and Dr. Vinod Balachandranwith the Rising Star Award. To view the full invite, please CLICK HERE. 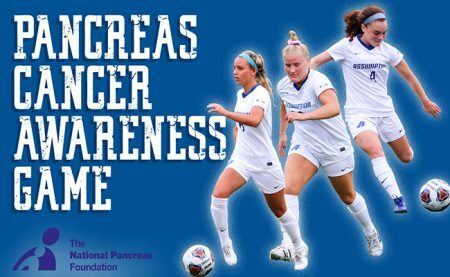 Assumption College Women’s Soccer and the National Pancreas Foundation will team up to host a Pancreatic Cancer Awareness Game, when the Hounds place Pace University at 7 pm! CLICK HERE to read more about the game and what it means for Assumption College. 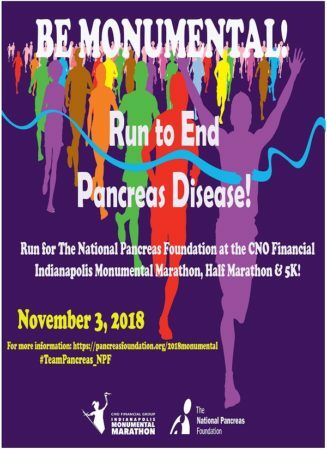 Selected as a charity partner for the 2018 CNO Financial Indianapolis Monumental Marathon, the NPF is looking for a group of people to run in the name of finding a cure, in memory/in honor of a loved one, or supporting an organization that provides hope and courage to those suffering from pancreas disease. Distances are: marathon, half-marathon, and 5K! Voted as one of the biggest marathons in the U.S. – this race is an ideal fall marathon! If you are interested, please CLICK HERE and we will contact you once within 24 hours! 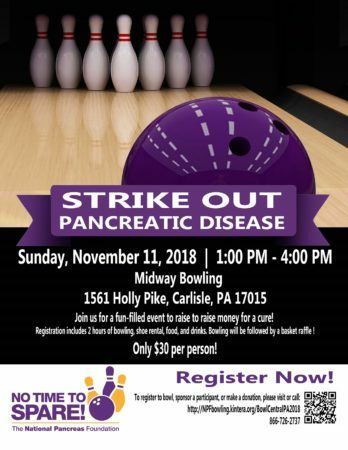 Join the National Pancreas Foundation on Sunday, November 4, 2018 for an afternoon of bowling and family fun! There will be food, raffle items, and a host of other on-site games to help raise money for a cure. If you have any questions please contact Diane at Dctonelli@hotmail.com. To register or sponsor a participant, please CLICK HERE. It’s a Party for a Cure! Join the National Pancreas Foundation Massachusetts Chapter on Thursday, November 8, 2018 from 6:30-9:30 pm, at The Harvard Club located in Back Bay (374 Commonwealth Avenue, Boston, MA 02115). 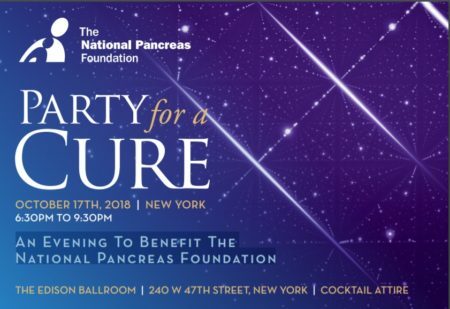 Please join us to support NPF research and its mission to find cures for all pancreatic diseases – cancer (the third leading cause of cancer deaths in the U.S.) and pediatric, acute and chronic pancreatitis. 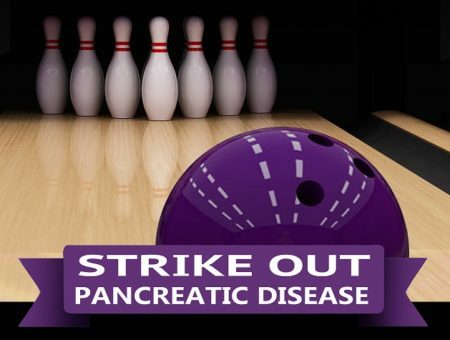 Join us for Strike-Out Pancreatic Disease – Central PA! Tickets are $30 per person! Two games of bowling, shoes, food, and fun will be provided along with a silent basket raffle. To register, please go CLICK HERE. If you have any questions please contact Lora Kelly at centralpa@nationalpancreasfoundation.org. We look forward to seeing you on November 11th!